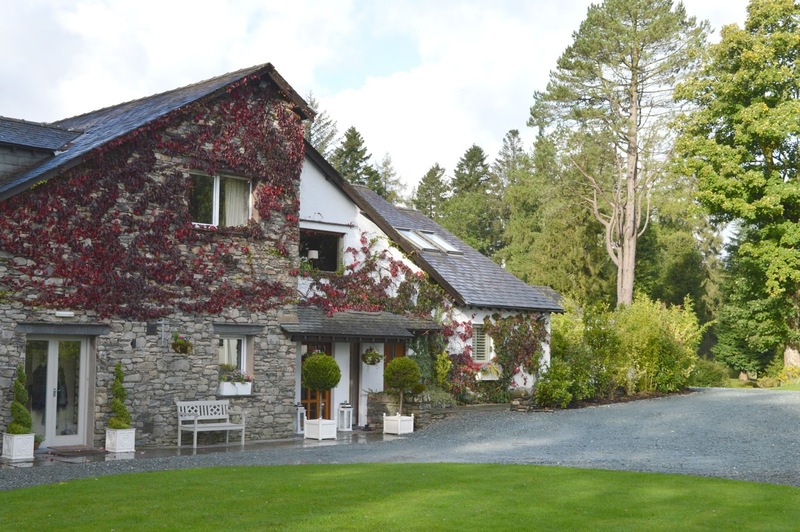 Get ready to join us on our luxury Lake District Minimoon in Paradise! 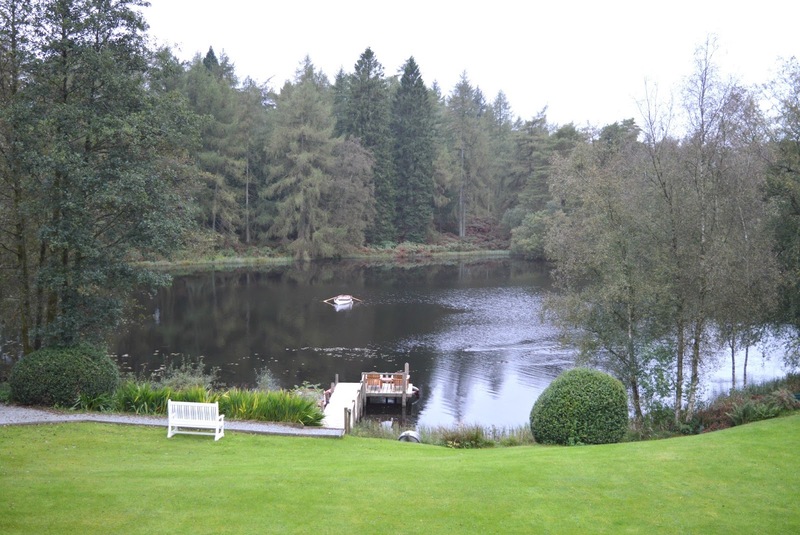 Our Minimoon at the Gilpin Hotel and Lakehouse near Windermere was like something out of a dream. We knew that we didn't want to go away on Honeymoon straight after our wedding. Planning a wedding is exhausting and the thought of jumping on a plane a few days later was enough to make us want to lie down in a dark room. Minimoons are becoming more and more popular with couples wanting a peaceful and relaxing short break after their wedding and it sounded like heaven to us. 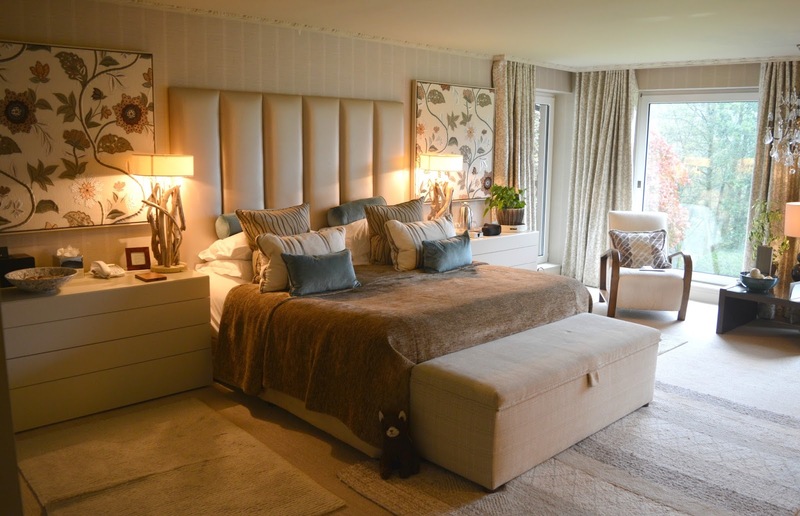 We quickly came up with a list of requirements and decided we wanted to find somewhere luxurious yet cosy that wasn't too far from home and could offer us beautiful views, delicious food and time to relax. The Gilpin Hotel and Lakehouse on Bowness-in-Windermere ticked every box and their beautiful Minimoon Packages offered us our dream. The price made our eyes water and being a couple who are very careful with our pennies we did worry about spending so much on a few days away but we decided that for once we'd let ourselves go just that little bit crazy. There are a few Minmoon packages to choose from at the Gilpin but we decided to really treat ourselves and went for the Platinum Package which gave us a room at the beautiful Lakehouse, a mile down the road from the Gilpin Hotel. Offering 100 acres of private grounds, access to the Jetty Spa and one of the beautiful Lakehouse rooms. There are only six rooms at the Gilpin Lakehouse giving us the exclusive and private Minimoon that we desperately wanted. We turned up to the Gilpin Lakehouse on a day that was pretty miserable. As our car pulled up at the door we felt pretty fed up at the thought of heading outside into the rain that was hitting our car at all angles. So we were over the moon when a lovely man appeared with an umbrella, escorted us to the door and told us that he'd arrange to have our luggage delivered to our room and get our car parked for us. Wow! At this point we knew our Minimoon would be worth every penny and we really had arrived in Paradise. 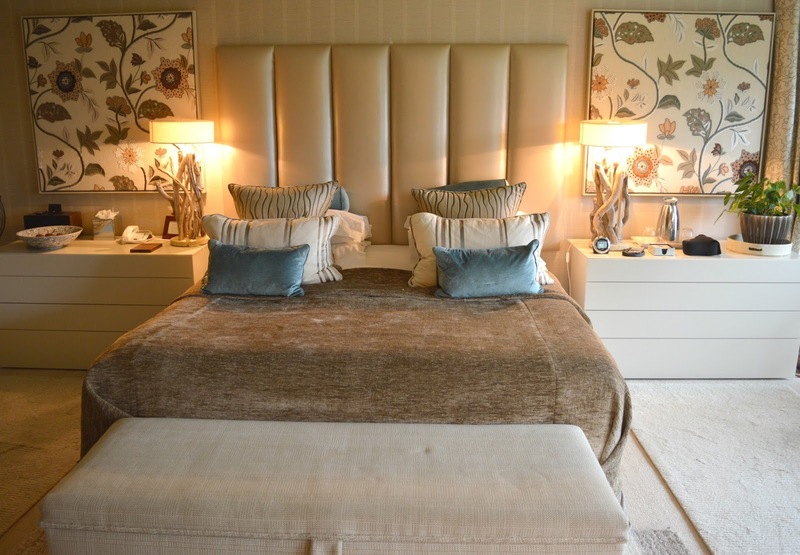 Walking into the Gilpin Lakehouse we immediately noticed how warm, cosy and quiet it was, we were told that the hotel was fully booked yet the place felt so exclusive and private (in fact over the course of our stay we barely saw any other guests!). 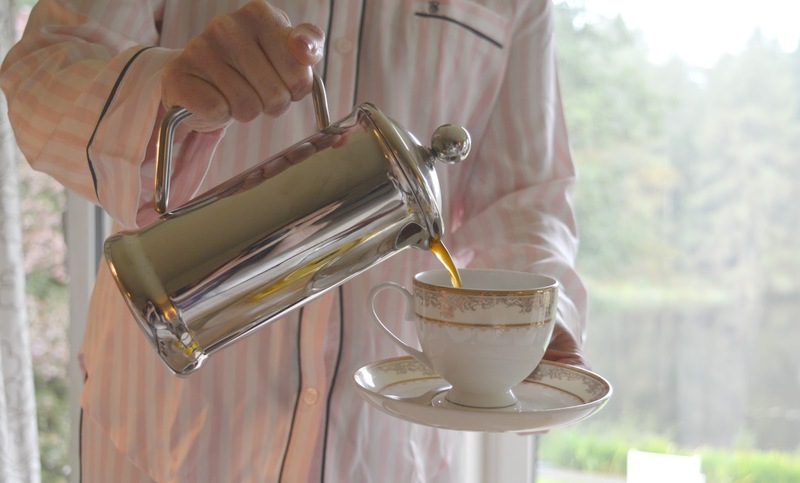 We were given a personal tour of the house before being shown to our bedroom and given a complimentary pot of tea to enjoy in our room (served on a beautiful silver tray). Being a lover of all things beautiful I eagerly studied the rooms at the Lakehouse before we booked and decided that Harriet was the one for us. We put in a request at booking and were thrilled to find it was still available, giving us the very best room in the house. Harriet was even more beautiful than the photos we had seen on the website and it took a lot of self control for us not to jump up and down on the bed like two over excited children. Our bed was huge and covered in piles of comfortable cushions - we watched a few films during our stay and cosying up amongst the cushions was heaven. 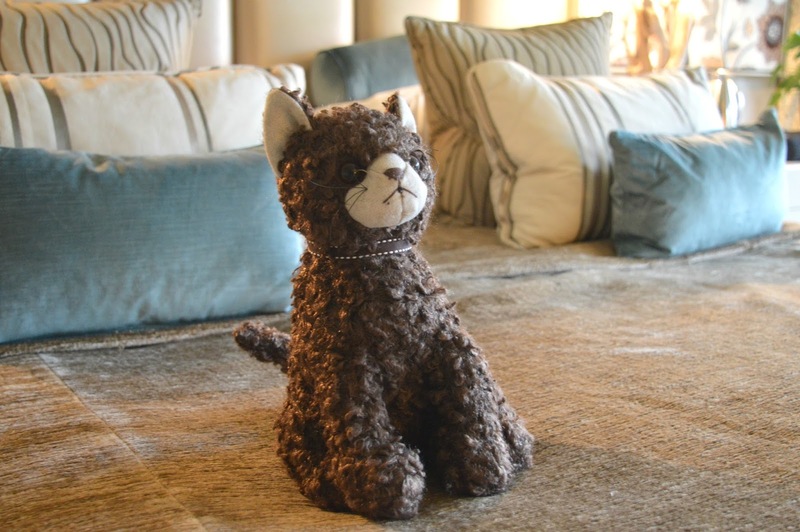 Luxury, comfort and privacy are high on the agenda at the Gilpin and we loved that each room had its own toy cat instead of a "do not disturb" sign. If we wanted to be left completely alone in our room we only had to put the cat out. 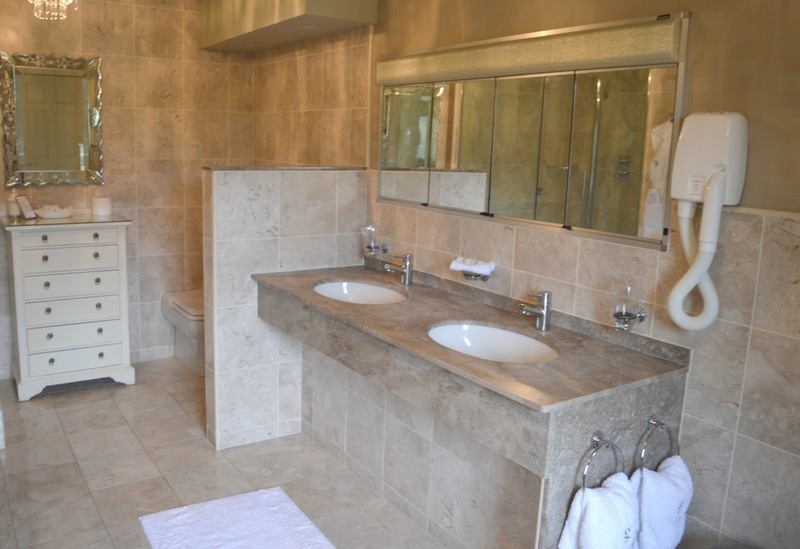 Our ensuite bathroom was directly out of an Instagram dream with a his and hers sink, a large bath (complete with romantic candle) and a vanity table. The shower was hot and powerful and I honestly could have spent my entire stay just chilling out in the bathroom. We both agreed that our favourite part of staying in Harriet was the very special view that we had. 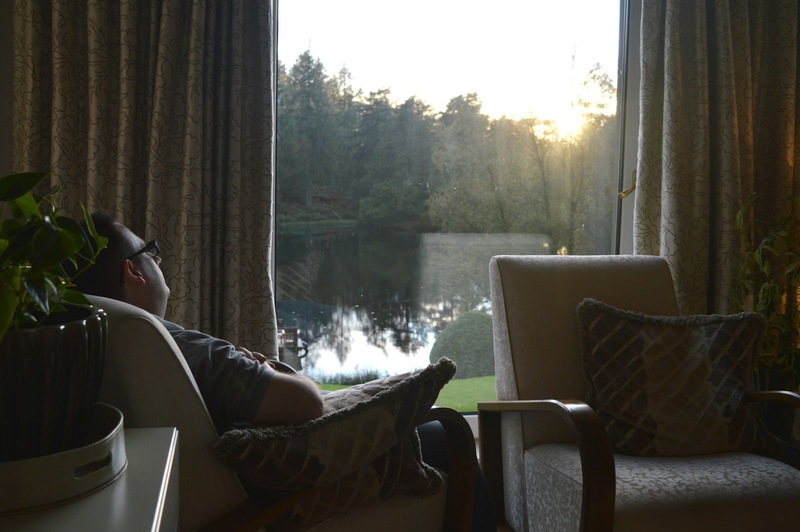 Our huge windows looked out over the Gilpin's lake and we lost several hours sitting in comfy chairs by those windows reading and looking out at the scenery. The rainy days were the best, nothing beats sitting in a thick dressing gown listening to the rain lashing down on the lake outside. Our Minimoon package set out clearly what was included in the cost of our stay and having been through the details on the phone when we booked (times we wanted dinner, dietary requirements etc) we were able to relax knowing that everything was taken care of. It's not often that you can truly relax without a care in the world but the Gilpin let us do just that. After spending a blissful first few hours in our room reading we retired to the lounge whilst our bed was turned down for the evening and a table was set up in our room for our private dinner. Not wanting to inconvenience us the hotel arranged complimentary drinks for us as we waited. When we arrived back in our room we couldn't believe how romantic our table looked. 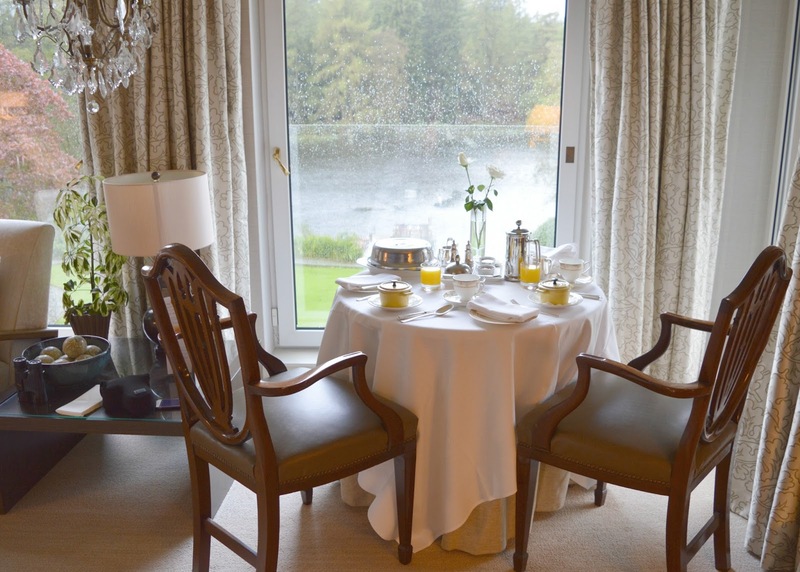 Lit by candlelight, it had been positioned by the window overlooking the beautiful lake view. We decided to enjoy our arrival Champagne with our food and had a blissful romantic meal for two in the privacy of our own room. I wish we could dine like this all the time it felt so special and is definitely something that we will both remember for many years to come. We went to sleep with very full and happy tummies. 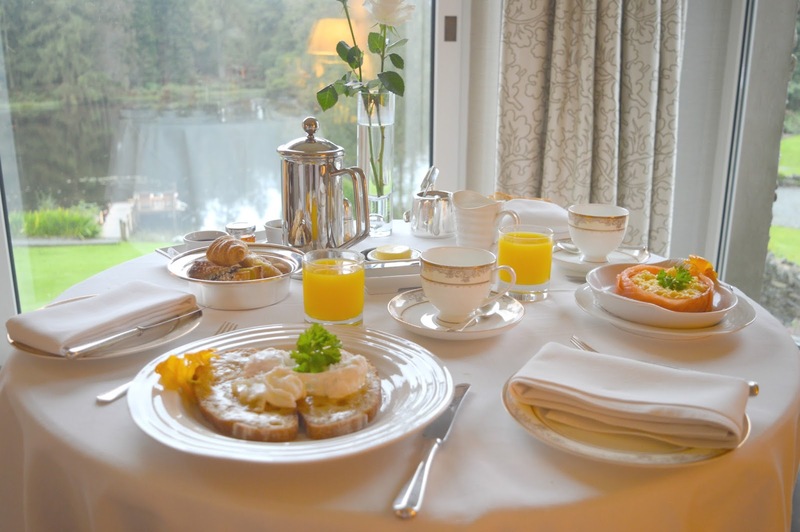 Breakfast at the Gilpin Lakehouse is ordered the night before from a menu that is packed with so many tempting treats. 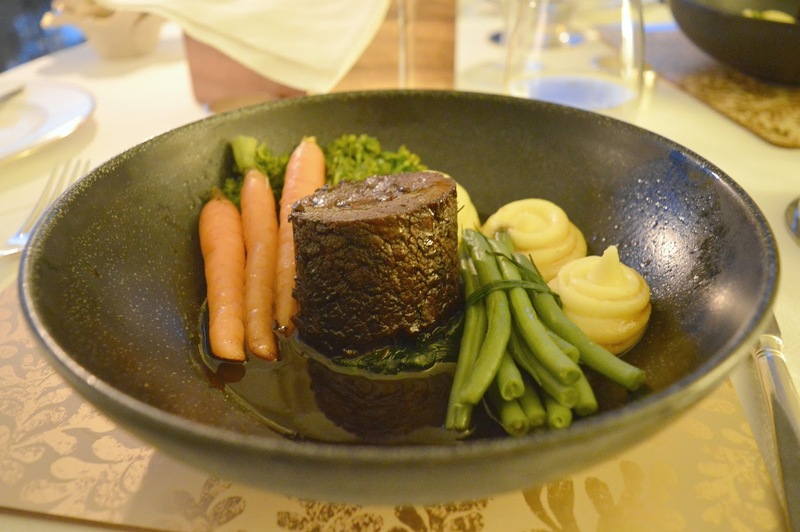 Whether you want a simple continental, fruit or a full four course feast everyone is catered for and for big foodies like us it was so hard picking what to eat. 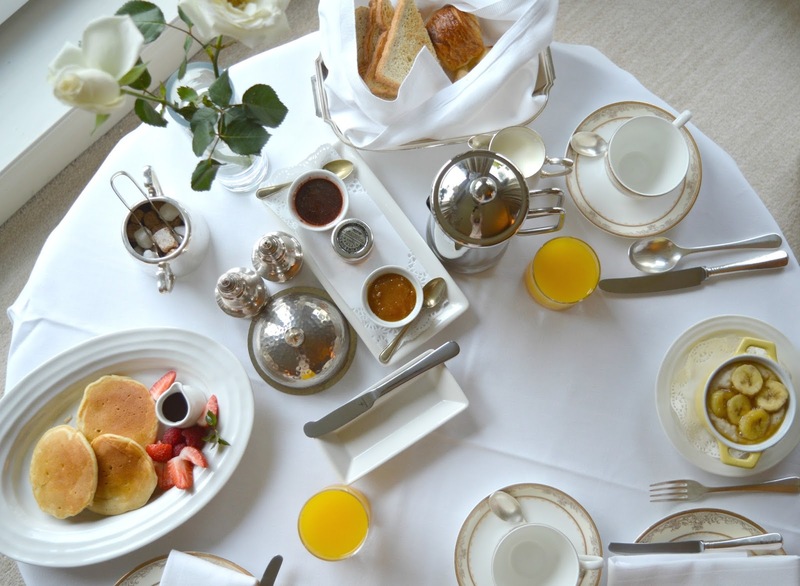 We had the choice of having breakfast each morning with other guests in the conservatory, at a table in our room or served on a tray in bed. The first morning we opted to have it on our table as it was already there from dinner the night before. 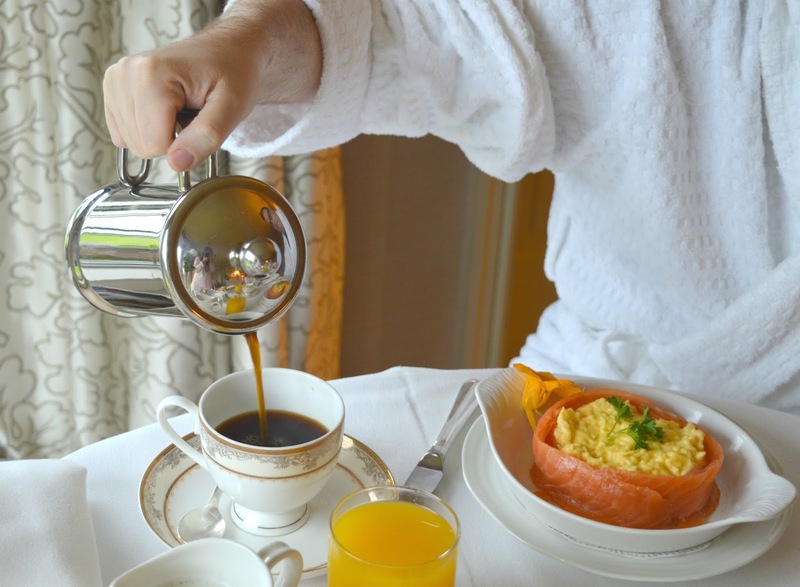 It was hard not to be greedy with the Gilpin breakfast and we ordered Welsh Rarebit for me, Smoked Salmon and eggs for him with toast, pastries and a pot of fresh coffee to share. Perhaps a little greedy but when you see what else we could have had we were being pretty reserved really! 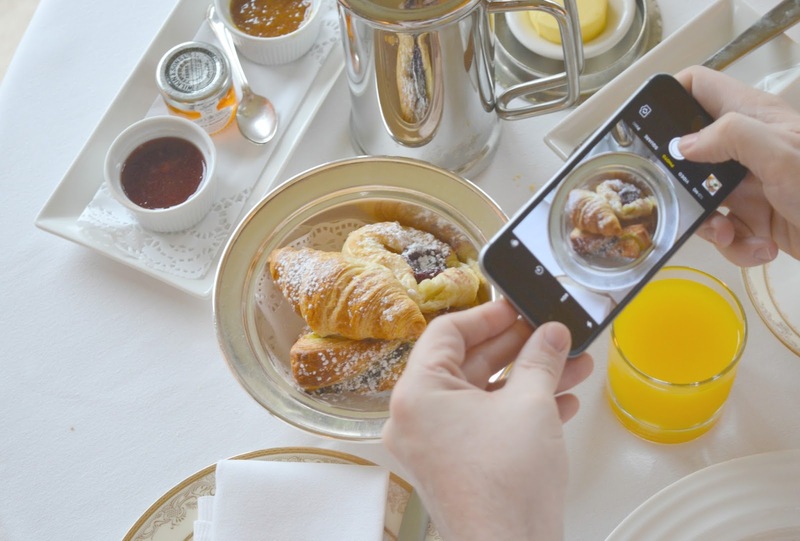 Breakfast in the privacy of our own room was a dream for us and meant that we could clamber about taking as many foodie photos as we fancied without other guests thinking us slightly weird. Next time Simon moans that he's an Instagram husband and has to put up with me photographing his food all the time let's just remind him of this moment. Believe me, the breakfast the Gilpin is too beautiful not to photograph. After breakfast we were ready to explore the grounds. The Gilpin boasts a beautiful little walk round its lake. Putting on our wellies and waterproofs we trudged about in the mud with huge smiles on our faces. It felt great to get out in the fresh air after such a breakfast feast and the short walk offered us some great views of our temporary home. It didn't matter that the weather wasn't perfect, it was idyllic. 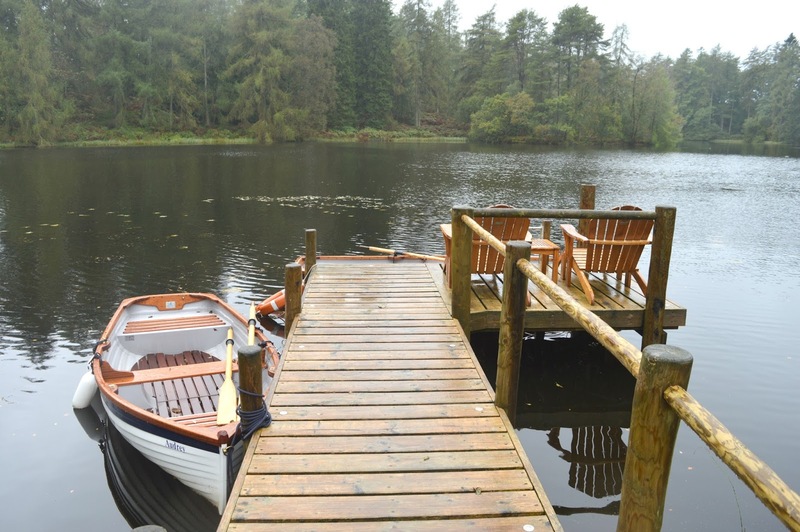 There are two beautiful little rowing boats on the Gilpin Lake that are available for guests to take out for a romantic trip across the water. I should imagine it's beautiful in drier weather. Our afternoon was spent on the Gilpin's Jetty Spa Trail (more on that tomorrow) with a couples massage, fizz in the hot tub and afternoon tea. It really was the perfect way to recover from the madness of the wedding. In the evening it was time to put our fancy gear on ready for a Five Course Tasting Menu with matching wines at the Gilpin Hotel. Our personal chauffeur arrived at 7:00 pm to pick us up and drive us the mile up the road to the Gilpin where we were shown to the bar for pre-dinner drinks and canapés. The cocktail menu at the Gilpin had all of my favourites and Simon was particularly happy that he could order an Old Fashioned. We took seats at the bar and had a lovely time chatting to the barmen and watching them creating beautiful cocktails. The Gilpin may be fancy but it has a wonderful friendly and relaxing atmosphere. We were shown through to the main restaurant which is split across several small rooms giving it a lovely intimate feeling. Our waitress for the evening was fantastic, talking us through all of the dishes and giving us plenty of opportunity to slow down if we needed time to digest. Neither Simon or I had ever had a tasting menu before and it was something that I'd been curious about for a while. I'm really happy to say that we absolutely loved it, the food was outstanding (we were overjoyed when just a week later the Gilpin were awarded a Michelin Star), the service was incredible (being a nut allergy sufferer I've never felt so safe and well looked after) and we even discovered some new wines that we loved. When we were ready to leave our chauffeur was there to pick us up and take us back to the Lakehouse - we felt like royalty! The next day, despite full tummies from the tasting menu, we were very excited about the prospect of having another delicious breakfast. 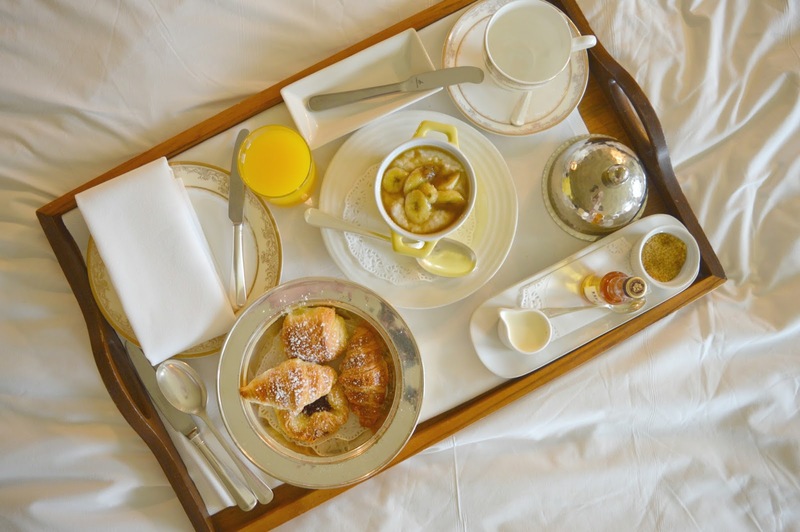 We decided to go slightly smaller this time and I managed to convince Simon to let us have the tray service in bed rather than a table set up in our room. 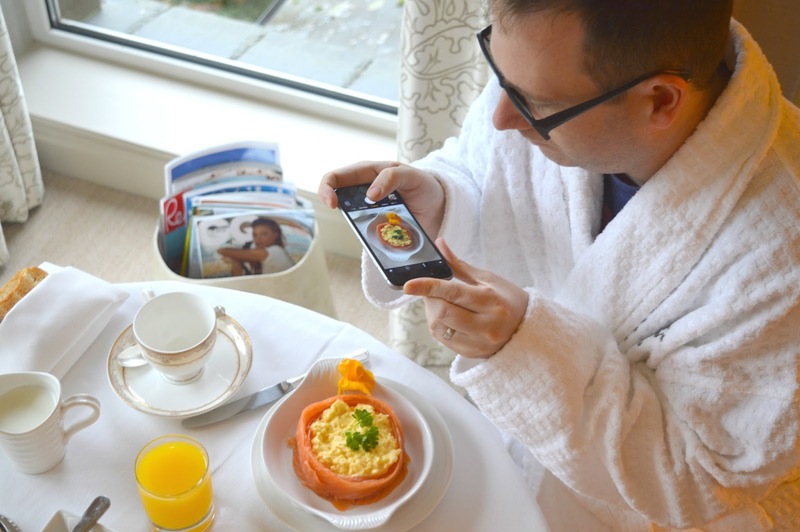 This was partly because I loved the idea of lounging about in bed eating breakfast, but mostly because I couldn't resist the photo opportunity. 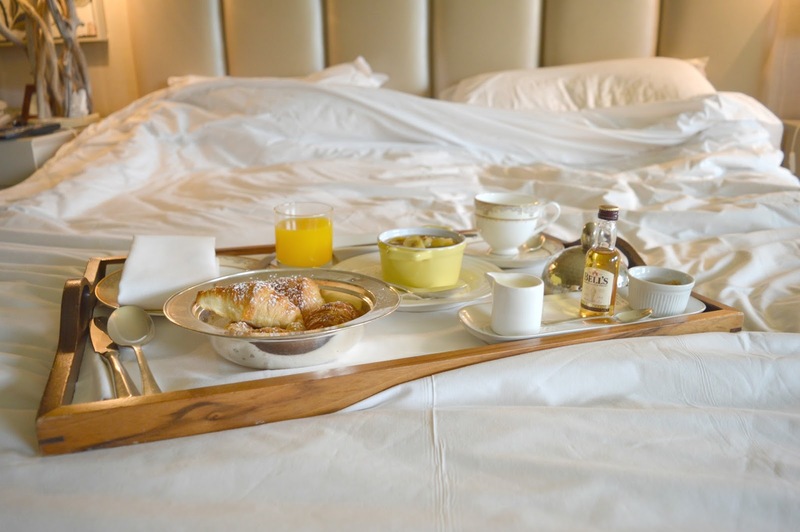 It's not every day you get to experience such a beautiful breakfast served on such a plush bed. Our menu choices this time were porridge topped with caramelised bananas which was so creamy and easily the most indulgent porridge I've ever had, followed by a tray of pastries. We may have been full but we managed to demolish the lot, including endless cups of fresh coffee. 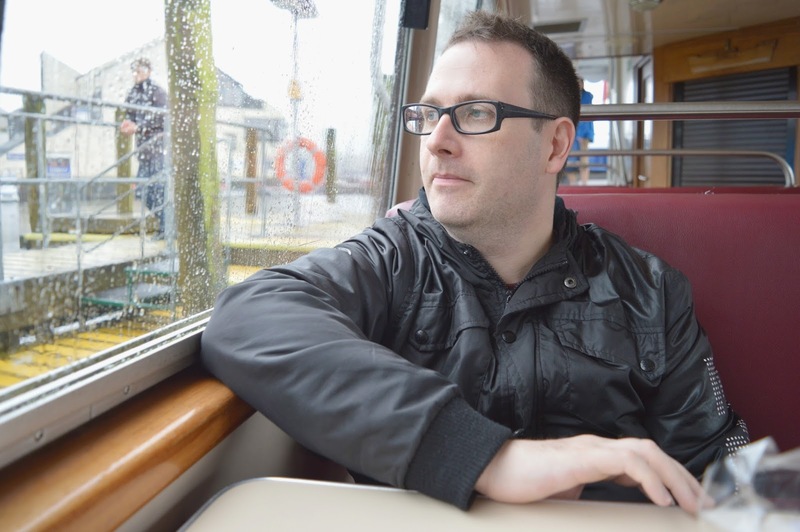 The Minimoon itinerary had us ready for a day exploring and boating with a gourmet picnic in Windermere so, facing another wet and miserable day, we zipped ourselves up in our waterproofs and headed out in the rain to join the crowds in the Lake's tourist capital. Talk about a bump back down to reality! 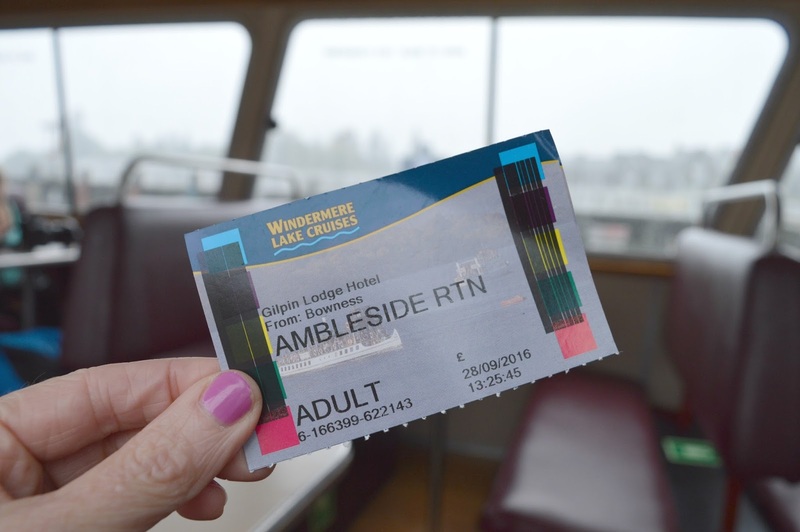 The Gilpin gave us a voucher to exchange for a ticket on a Windermere Lake Cruises boat where we joined lots of other soggy looking tourists on a trip of Lake Windermere, a little bit of a shock to the system when we'd barely seen a soul for days. I think on a nicer day the cruise would have been stunning but we really did have the wrong day and with all the views hidden by a thick sheet of mist and rain we spent most of our trip on the boat counting down the minutes until we could get back to the Gilpin. We really wish that we'd instead spent the afternoon snuggled up in our room enjoying a few films with a picnic lunch and I'd say that if you do find yourself Minimooning at the Gilpin on a very wet and overcast week that it's probably best to skip the Windermere Cruise. We'd decided to leave our picnic at the hotel, not really fancying taking it out in the rain with us so by the time we got back to the hotel it was a little too late to properly enjoy it. The food was delicious but we had to pick at it to save ourselves some room for dinner a few hours later. Dinner on the second night was a relaxed Four course and again we were picked up by the Chauffeur and taken to the Gilpin to dine in their gorgeous restaurant. Knowing the menu pretty well from our tasters the night before Simon and I made confident menu choices and couldn't resist ordering our favourite wine from the previous night. I think it's safe to say that next time we're visiting the Lakes we'll definitely be booking ourselves in for another meal at the Gilpin. We awoke on the third day with a horrible sinking feeling. We were about to leave our luxurious pretend lives behind and head back home for the reality of dirty dishes, office jobs and piles of laundry. Luckily there was one last breakfast blowout before we checked out and we went to town and enjoyed a feast at the table in our bedroom. I've never been so sad to leave a place in all my life and I would recommend the Gilpin to anyone looking for that perfect romantic getaway. It is not the cheapest break but in our eyes it was worth every penny - the hotel was beautiful, the service was outstanding, the food was phenomenal and we were made to feel truly special by everyone. I really hope that one day we'll be able to return to the Gilpin, but for now we have some beautiful photographs and some very happy memories of our perfect Minimoon. It really does look gorgeous there. I think we will check it out one day. I'm pleased you had such a lovely minimoon! Wowser actually amazing!! i've never stayed anywhere as flash as that before! we did go to the lakes this summer but were in a tent! !